Ice-T wants to make one thing crystal clear ... he and Coco are NOTHING like Kim and Kanye, but he does think Ye and Trump are birds of a feather. We got Ice-T and Coco in New York City Saturday, and Ice had nothing but disdain for the Oval Office meeting. He thinks Trump is so entrenched in his views, no one's going to change them ... and Kanye was just used by the Prez to score more African-American voters ... or at least that was the plan. And check out what happens when our photog compares them to K & K.
Kanye West took a break from family time in Africa to get in touch with the world via social media once again, and his purpose was to speak out against mind control ... and oddly, social media. Ye returned to Twitter Saturday afternoon after going dark last week, and live streamed himself from Africa, talking to the camera while constantly rubbing his forehead ... appearing to be deep in thought and focused on his words. But ... as he even admits ... he also seems sleep deprived. Kanye captioned his vid "Mind control," and started off by railing at social media and discussing how he's hurt by people trying to tell him what to do. He says it feels like they are trying to touch his brain ... and he hates it. He adds to his social media bashing by saying it told us all Hillary Clinton was going to win the presidency, and claims social media falsely wants you to believe people don't like him when in fact ... "Everybody loves Ye!!" There's more -- a lot more -- including Kanye declaring "I am the best living recording artist," boasting about his IQ and assuring us all he's not crazy ... he just needs some sleep. Kim Kardashian hit up Cher's concert in Vegas Friday night with the girls from Marymount High School, class of 1998. Kim and her classmates went on the road to continue their 20th high school reunion celebration. No sign of Kanye at the concert or in Vegas. TMZ broke the story ... Kim and Kanye flew to Wyoming earlier this week so he could put the finishing touches on his albums. We're told Kim has been watching Kanye like a hawk since his appearance on "TMZ Live" ... so maybe the Vegas girls trip is a good sign. Kanye West thought he'd get killed while being hospitalized at UCLA after suffering a mental breakdown. In the newly released interview with Charlamagne tha God, West talks about his 8-day hospitalization in 2016. He says Kim was out of town when it happened, so he was only accompanied by friends when he was first admitted. Kanye said he begged his friends not to leave his side, but at one point they were forced to and Ye calls it the scariest moment of his life. Kanye mentions he thought docs would drug and kill him while he was alone. However, earlier in the interview he mentions the love he felt from several African-American employees in the hospital. West also opens up to CTG about his medication, saying he's on several ... but doesn't mention them by name. 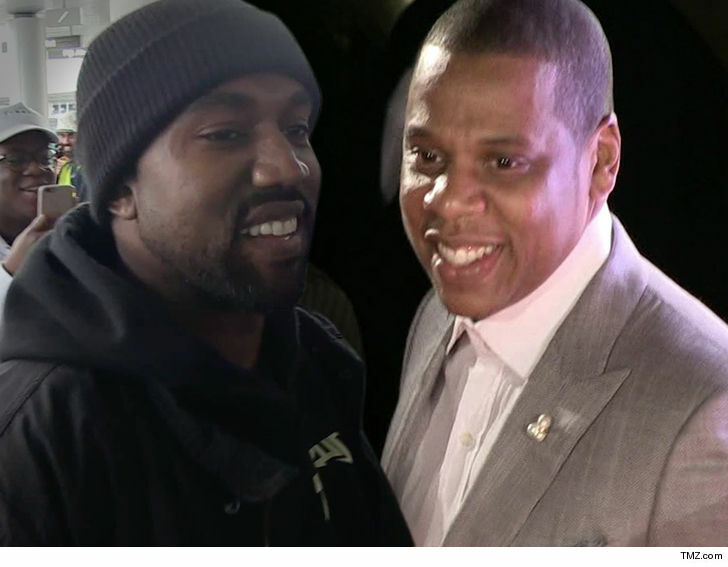 Kanye West and Jay-Z will be meeting face-to-face soon to squash their latest beef, and if they smoke the peace pipe it will end a lawsuit that looms over their multi-million dollar Tidal dispute. Sources close to Yeezy and Hova with direct knowledge of the situation tell us, their lawyers have been trying to settle a $3.5 million dispute Kanye has with Tidal. As we reported, Kanye had fired off a letter to Tidal stating his contract with them was over because Tidal didn't live up to his end of the bargain. Specifically, Kanye says he didn't get advances and bonuses that totaled $3.5 mil. We're told Kanye and Jay have not agreed to settle, and the reason became apparent to everyone. The impasse had nothing to do with their business dispute -- $3.5 mil is peanuts to both of them. They couldn't settle because they each harbor animosity toward the other. Jay was enraged when Kanye attacked Beyonce at his concert last Fall. Kanye felt Jay should have cut him a break because that was the time he was melting down and just a few weeks after the concert, he was placed on an involuntary psychiatric hold. 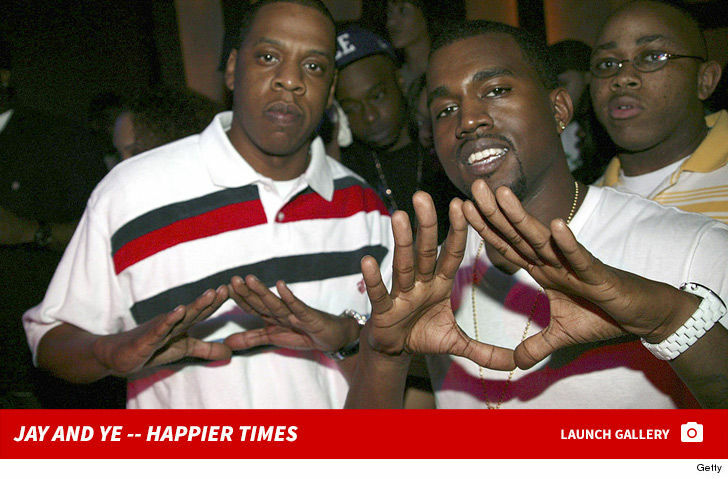 As one source put it, "The Generals [Kanye and Jay] have to meet face-to-face. When that happens, the resolving the money dispute is a piece of cake." We're told Kanye is up for the meeting and Jay is also inclined to meet. It shouldn't be hard. Now that Jay and Bey live in a Bel-Air mansion, they are literally down the street from Kanye and Kim. We're told the meeting should go down soon, and once it does their Tidal dispute will quickly end. 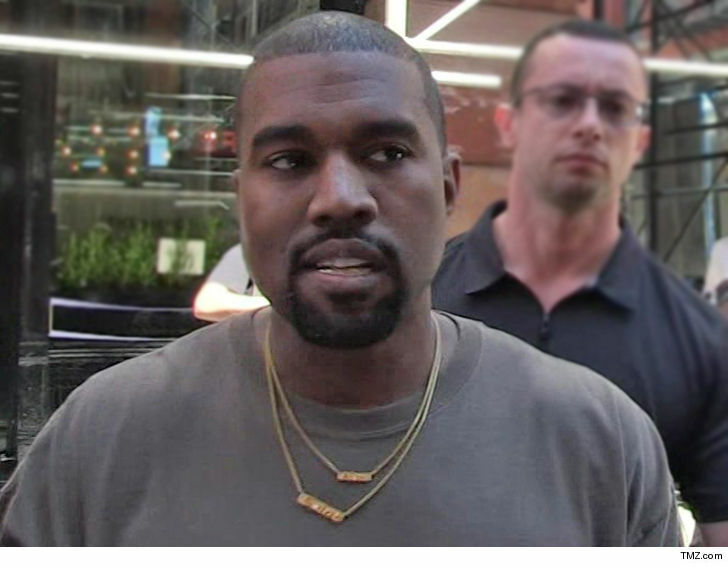 7:57 AM PT -- A rep for Kim and Kanye tells us the money won't be enough ... they also want a full retraction of everything he said in the interviews. Kim and Kanye﻿ have threatened their former blabbermouth bodyguard with a $30 million lawsuit, and he's gotta drop to his knees and apologize. We've learned Kim and Kanye's lawyer has fired off a letter to Steve Stanulis ... the bodyguard who went to anyone who would listen, claiming he was fired for chatting up Kim on the job and making Kanye jealous. Kim and Kanye have both said it's a complete lie. Turns out, we're told that Steve signed a confidentiality agreement promising never to breathe a word about Kim, Kanye or the klan. We're told the lawyer's letter is quick to mention a provision which says Steve is automatically on the hook for $10 mil if he opens his mouth ... and they believe he did at least 3 interviews. It's interesting. We're told Kim and Kanye's lawyer gives Steve an out, if he shuts his trap and issues a public apology to the family. Our sources say the letter does not ask Steve to admit he lied but they demand he stop talking to the press. Kim and Kanye think Steve's MO is simple ... it's a cheap, underhanded way to get famous. A rep for the couple tells us, "This sad, parasitic maniac has violated every basic human tenet of decency with his story of lies. The Wests will explore all legal means at their disposal to silence this nonsense." BTW ... this isn't the first time Kim and Kanye have gone after someone for violating the confidentiality agreement. TMZ broke the story, YouTube founder Chad Hurley weaseled his way into AT&T Park in SF and videotaped Kanye's marriage proposal. Chad signed a confidentiality agreement and ended up paying them $440,000. North West is gonna have a little brother to taunt, because Kim Kardashian just spilled the beans. Kim chose the appropriate day for the reveal on social media, saying to Kanye, "Precious moments like this when we were traveling on tour with you and what I live for," adding, "You're such a good daddy to North & you will be the best daddy to our new son too!" We had heard it was a boy for a few weeks, but Kim chose to make it official late on Father's Day. Presumably Caitlyn Jenner will be the child's grandfather ... at least if consistency rules. But you never know. Kim Kardashian -- I'm Having a Winter Baby! Kanye West I Listen to Me in the Car! Kanye West is one satisfied customer -- with his new album. We got Kim's hubby arriving at LAX Friday, and he told our photog about his next album, which he was listening to on the way to the airport. Kanye was super friendly ... which is becoming SOP. He made it clear ... his album is great. Fact is ... most people who say that are just blowing smoke. In Kanye's case, he has a track record of awesome records, so he's probably right. Kanye West isn’t the biggest "Frozen" fan in the world and the ice princess onstage at Disneyland gave him a cold stare for it. Kanye must have been exhausted from walking around the park for North West’s birthday -- 'cause he caught some major ZZZZZs during the "Frozen" sing-along show. The problem for Daddy West is he's pretty high profile. Our park sources tell us the employee was the woman who played Elsa. 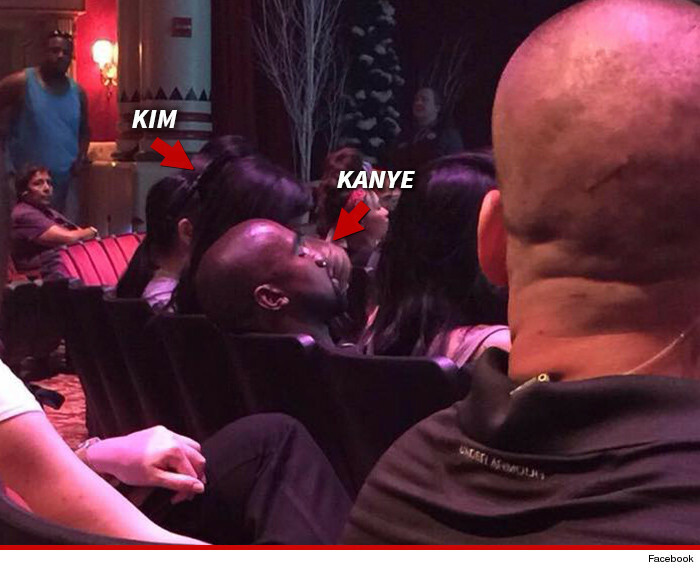 We're also told Kanye passed out for the entire performance, which is only 25 minutes. So, kinda perfect time for a nap. 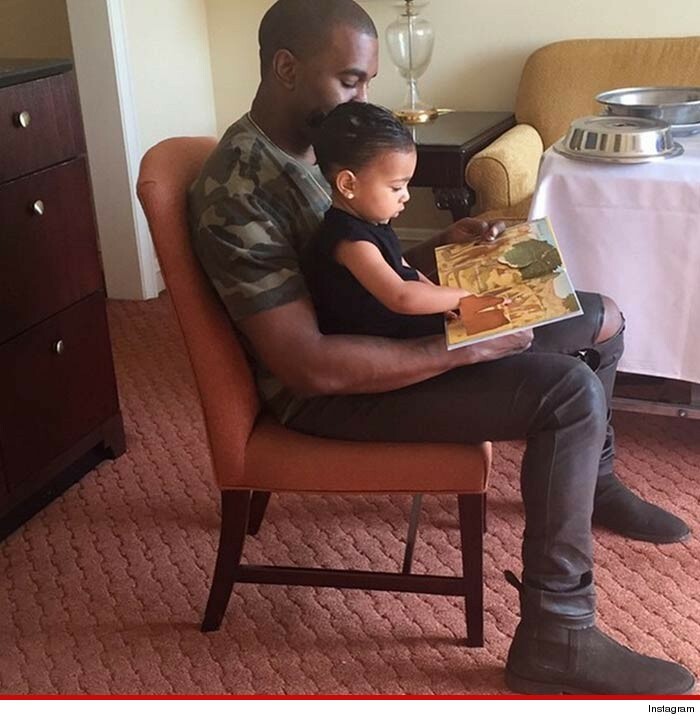 Bottom line here ... Kanye's just like most other dads. North West I Can't See Mickey ... Too Many Damn Security Guards! North West's trip to Disneyland for her second birthday would have been amazing ... if only she could have seen through the massive security team following her around. The majority of the Kardashian klan made the trip to Anaheim to celebrate, including Tyga and his son. Instead of trying to blend in, Kanye, Kim and company rolled around with what looked like a dozen security personnel escorting them around the park. It may be a 'Small World' ... but North's got BIG company in it. Kanye West was like a human Bugatti -- going zero to 100 in a matter of seconds to get the hell out of Drake's epic party ... when he found out his ex Amber Rose was there too. We’re told Yeezy was chilling for about 40 minutes, having a good time with folks when the DJ got on the mic and sounded the alarm -- announcing Amber had entered the building. Sources close to the rapper tell us he wisely didn’t want to chance bumping into her, or worse -- getting photographed near her. We're told Kanye waited for his boys to pinpoint Amber's location ... and then made a quick, quiet exit in the other direction. 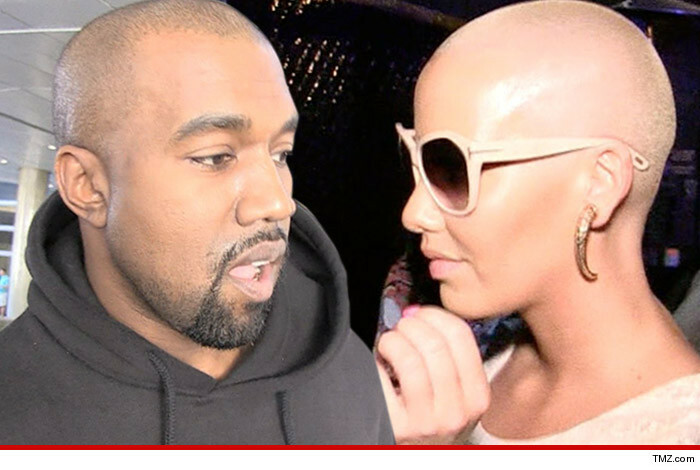 The exes beefed earlier this year -- when Amber called Kim Kardashian a whore, and Kayne hit back with his infamous jab about Amber's, umm ... hygiene. Good thing he didn't have to rinse off this time. 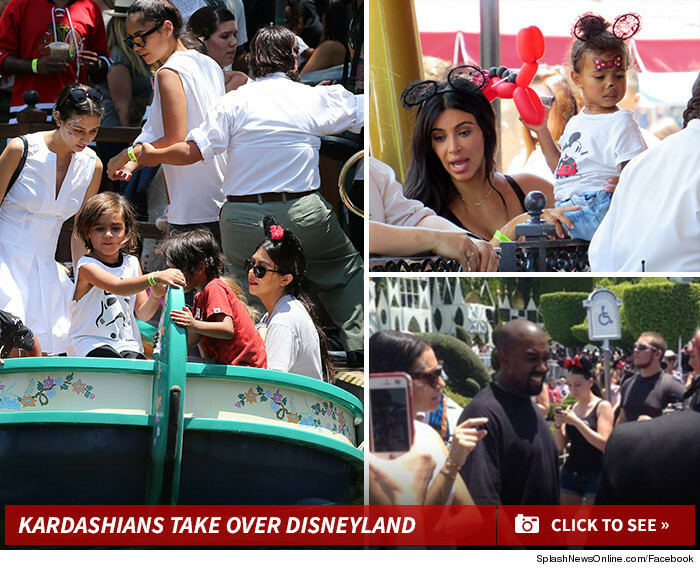 North West had an awesome second birthday she'll never remember... at Disneyland. The Kardashian klan was on hand -- Kim, Kanye, Kourtney, Kendall, Kylie, Mason, Penelope, Tyga and his son King Cairo. No sign of Kris Jenner or Scott Disick, but still ... solid turn out. They did the usual kids stuff ... lots of rides and a petting zoo. Soak up the attention while you can, North ... your little sibling is coming soon! 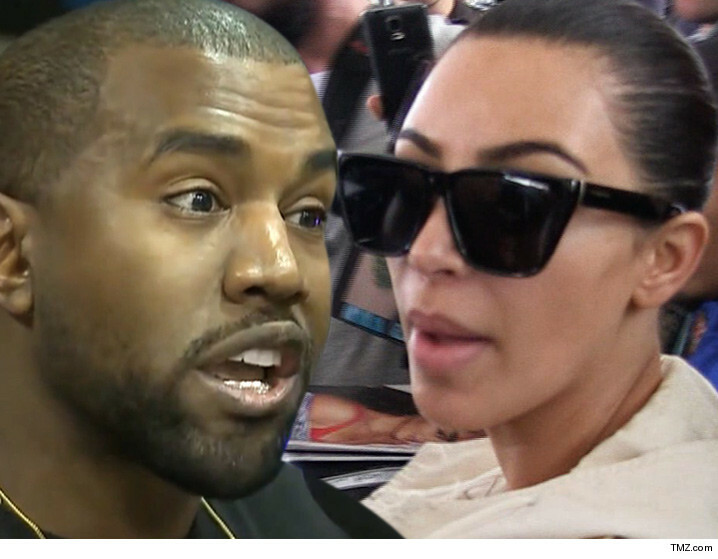 Kim Kardashian -- I'm Pregnant! Kim Kardashian stuck with the BALLS theme for Kanye West's birthday, because when he got home from playing hoops at Staples Center with his boys ... she dropped another surprise on him. Kim tipped off part TWO of Yeezy's birthday by unveiling his very own basketball sanctuary ... IN HIS BACKYARD!! While Kanye was shooting around with celebrity friends on Monday, Kim had construction crews break ground on the new home court going up at at their home. All in all , the 7,000 sq. 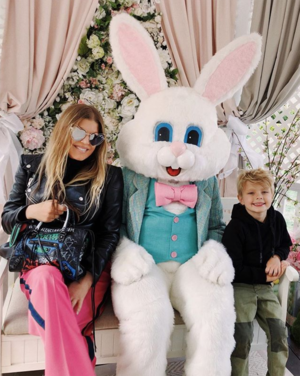 ft addition to their Hidden Hills mansion will include the tricked out basketball court AND a glam room -- probably a little gift for KK herself. All this, just for his 38th. Ye's 4-0 is gonna be ridic. Kim and Kanye -- Happy Anniversary ... One Year and Counting!! !